They are not nearly as popular as the guards in England, and while I have never seen those in London, I think there’s a reason for that. 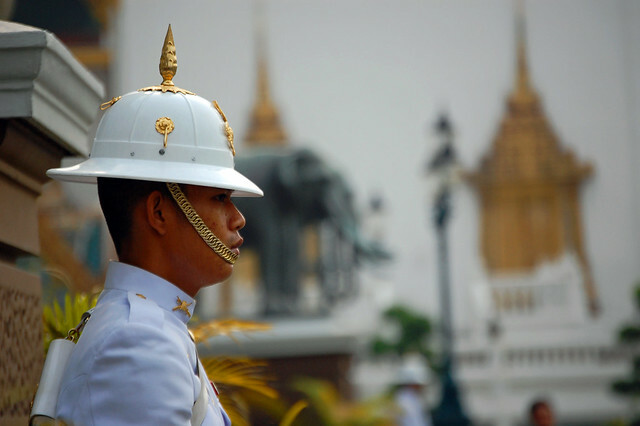 These men who protect the royal palace do their job in a thaily manner – they take it easy. Well, easy by royal-palace guard standards. Standing out there for hours and hours, they surely kind of must feel as if some divinity has taken a huge magnifying glass, focusing rays of the sunlight right onto their bodies to see if these guys will melt. But, sometimes you can catch one with his eyes wandering around the area, or even showing off a smile (I saw this once on the occasion when there was a group of particularly attractive Swedish tourists taking pictures with one of the guards). I’m not sure if the English guards would still be so English with Swedish tourists, but I suppose they would. If you ever make it on a Bangkok sightseeing tour and stop by these guards, I suppose you don’t make their job harder than it already is – unless you are a particularly attractive female tourists from Sweden.